3. Department of Radiation Protection and Health Physics, Institute of Radiation Medicine, 27, Taiping Road, Haidian District, Beijing 100850, China. To determine whether microwave (MW) radiation induces neural cell apoptosis, differentiated PC12 cells and Wistar rats were exposed to 2.856GHz for 5min and 15min, respectively, at an average power density of 30 mW/cm2. 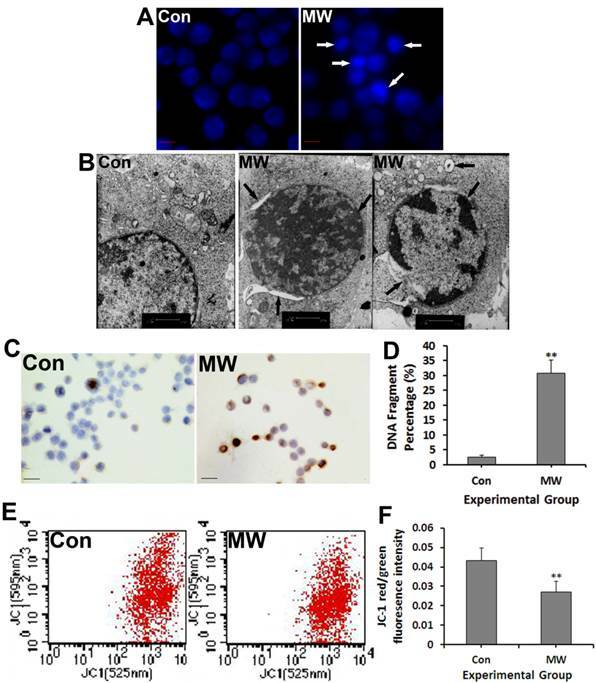 JC-1 and TUNEL staining detected significant apoptotic events, such as the loss of mitochondria membrane potential and DNA fragmentation, respectively. Transmission electron microscopy and Hoechst staining were used to observe chromatin ultrastructure and apoptotic body formation. 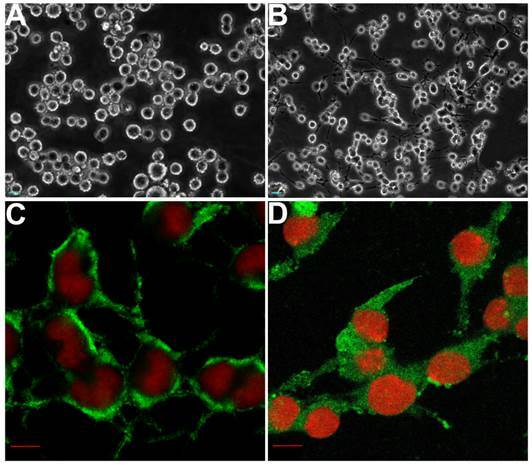 Annexin V-FITC/PI double staining was used to quantify the level of apoptosis. The expressions of Bax, Bcl-2, cytochrome c, cleaved caspase-3 and PARP were examined by immunoblotting or immunocytochemistry. Caspase-3 activity was measured using an enzyme-linked immunosorbent assay. The results showed chromatin condensation and apoptotic body formation in neural cells 6h after microwave exposure. Moreover, the mitochondria membrane potential decreased, DNA fragmentation increased, leading to an increase in the apoptotic cell percentage. Furthermore, the ratio of Bax/Bcl-2, expression of cytochrome c, cleaved caspase-3 and PARP all increased. In conclusion, microwave radiation induced neural cell apoptosis via the classical mitochondria-dependent caspase-3 pathway. This study may provide the experimental basis for further investigation of the mechanism of the neurological effects induced by microwave radiation. Keywords: Apoptosis, Caspase-3, Microwave, Mitochondria, PC12 cells. The effects of electromagnetic fields (EMF) on human health have been widely studied using a wide range of the electromagnetic spectra and several biological systems. As part of the electromagnetic spectrum (from 300 MHz to 300 GHz), microwaves (MW) have attracted interest since the 1960s, when radar and microwave ovens were thought to pose a health problem . The thermal effects of EMF caused by temperature increase by direct energy transfer are well established, whereas there is a huge debate about the possible non-thermal effects [2, 3]. There are several reports of chronic exposure of brain neuroglial cells to EMF covering a wide range of frequencies, intensities and exposure times [4-12]. By contrast, very few studies have investigated acute exposure to EMF [13-15]. In these cases, the presented results are controversial and have failed to establish an unequivocal correlation between EMF exposure and neurotoxicity. Moreover, the observed effects are strongly related to the time, frequency and intensity of EMF exposure . In both humans and animals, microwave exposures are suspected to affect cognitive functions . Moreover, effects on neuronal electrical activity, cellular calcium homeostasis, energy metabolism, genomic responses, neurotransmitter balance and blood-brain barrier permeability have been reported . In spite of these previous studies, knowledge about the adverse effects of microwave radiation on human health, or the biological responses to microwave radiation exposure, is still limited, and the non-thermal mechanisms of MW remain unclear. Apoptosis, or programmed cell death, is an important biological phenomenon, because it provides protection in response to injury to minimize further damage initiated by the injury itself . Apoptosis is characterized by a number of cytological alterations, including chromatin condensation, DNA fragmentation and activation of cysteinyl aspartate-specific proteinases: the caspases . The pathways leading to apoptosis may be dependent on or independent of caspases. Caspase-dependent apoptosis was described and studied first, but caspase-independent apoptosis is now a widely recognized phenomenon . Little data are available concerning the interactions of EMF fields with the process that leads to apoptosis. In vitro studies conducted on different types of cells gave different results, indicating that sensitivity to EMFs may differ according to the cell type. Additionally, mitochondrial dysfunction has been reported in neural cells after microwave exposure [22, 23], which suggested that mitochondria might play an important role in the neuronal injury induced by microwave radiation. Upon nerve growth factor (NGF) stimulation, PC12 cells derived from a rat pheochromocytoma differentiate and display neurite growth . NGF induces the formation and elongation of neurites in PC12 cells . These cells exhibit morphological and neurochemical properties similar to those of dopaminergic neurons. PC12 cells are a useful model system for studying neuronal apoptosis and they express endogenous Bcl-2, Bax and caspase-3, which are considered as important regulators of apoptosis [26, 27]. Using NGF-differentiated PC12 cells, the present study investigated whether microwave radiation induced apoptosis in neuronal cells via the mitochondria-dependent caspase-3 pathway under non-thermal conditions. We explored the apoptosis of differentiated PC12 cells caused by microwave radiation of different intensities, and selected the lowest effective dose for further investigation of the mechanism. To further confirm that cell apoptosis was induced by microwave exposure, we detected several significant events of apoptosis such as externalisation of phosphatidylserine on the cell membrane, chromatin condensation, apoptotic body formation, DNA fragmentation and loss of mitochondria membrane potential (MMP) in the differentiated PC12 cells after radiation. Furthermore, the expressions of Bax, Bcl-2, cytochrome c, cleaved caspase-3 and poly (ADP-ribose) polymerase (PARP) were detected, and the activity of caspase-3 was examined in both PC12 cells and hippocampal neurons of rats after radiation. PC12 cells were cultured in Dulbecco's modified Eagle's medium (DMEM) supplemented with 0.35% glucose, 10% horse serum, 5% fetal bovine serum, and 100 units/ml penicillin/streptomycin. Cells were grown in 25 cm2 flasks or 6-well plates at 37°C with 5% CO2 in air. According to a previous publication , the cells were seeded at a relative low density of 2×104 cells/cm2 on culture dishes pre-coated with 0.1 mg/ml poly-L-lysine (Sigma) to improve cell adherence, and the medium was replaced by DMEM containing 1% horse serum and 7.5 ng/ml nerve growth factor NGF-2.5S (Sigma, USA) to induce neural cell differentiation 6 h after seeding. Half of the NGF medium was refreshed every other day. Five to seven days later, the differentiated PC12 cells were identified by immunofluorescence using neural specific enolase (NSE) and neural filament protein (NF) antibodies. Twenty male Wistar rats aged 8 weeks (weight 230.6 ±13.5g) were provided by the Experimental Animal Center of the Academy of Military Medical Science and randomly divided into a control group (Con) and a microwave group (MW). The Animal and Human Use in Research Committee of the Academy of Military Medical Science approved the protocol of the animal experiments. The microwave equipment was designed in our institute and comprised a radiofrequency generator, an arbitrary function generator, a narrow band amplifier, and rectangular waveguides. The entire setup was computer controlled. A dish holder facing the microwave-emitting antenna guaranteed that the dishes were placed correctly. The differentiated PC12 cells were exposed to continuous microwave radiation at 2.856GHz for 5 min with average power density of 10, 30, 50, 100 mW/cm2 , respectively. Animals were kept in a container made of Plexiglas and exposed to the same microwave conditions for 15min, with average power density of 30 mW/cm2. The average power densities were measured in the center position of the container placement using a waveguide antenna and a GX12M1CHP power meter (Guanghua microelectronics instruments, Hefei, China) and with GX12M30A power heads. The specific absorption rate (SAR) was evaluated by the simulation platform Empire (IMST-Empire v-4.10, GmbH, Germany), which is based on the finite difference time domain (FDTD) method [28-30]. The temperature of the cell culture medium and animals was monitored using an optic fiber thermometer (m3300, Luxtron Corp., Santa Clara, CA, USA) that stored the samples with a 1s intervals, and the highest temperature increase was less than 0.5°C during all the microwave exposure. 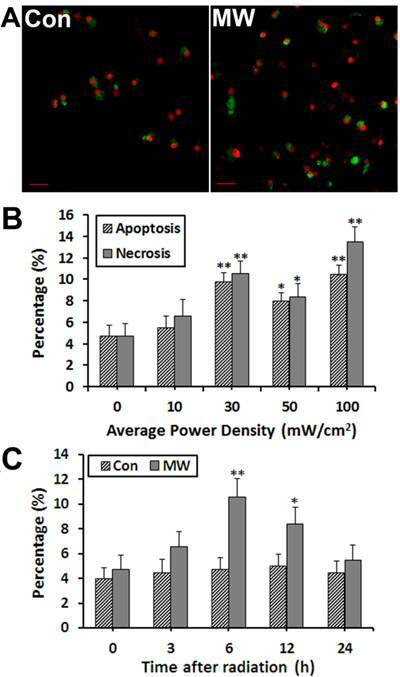 According to the relationship between the power density and apoptosis percentage, 30 mW/cm2 was selected for further investigation of cell apoptosis. Sham radiation control groups were treated under the same conditions without microwave exposure, and the following evaluations were performed in a blinded fashion. All exposures were performed in a shielded room and the room temperature was accurately controlled. The Annexin V-FITC kit (Baosai Company, Beijing, China) detected the externalisation of phosphatidylserine on the cell membrane, which is one of the typical markers for early apoptosis. . Differentiated PC12 cells were collected and cell suspensions were centrifuged at 1000 rpm for 5 min. The pellets were washed twice with cold phosphate buffered saline (PBS) and then resuspended in binding buffer at a concentration of 1×106 cells/ml. According to the manufacturer's instructions, 10 μl Annexin V-FITC and 5 μl of PI were added into each of the 500 μl solution, and the cells were gently vortexed and incubated for 15 min at room temperature in the dark. The samples were analyzed by flow cytometry (FCM, FACSCalibur, BD, USA) within 1 h. Counting the number of cells that were Annexin V positive but PI negative estimated the percentage of apoptosis, whereas counting cells that were both Annexin V and PI positive estimated the percentage of necrosis. After flow cytometry analysis, the samples were smeared on slides by centrifugation at 1000 rpm for 1 min, and then mounted in a mixture of glycerol and PBS (1:1) and observed via Laser scanning confocal microscopy (LSCM, 510META, ZEISS, Germany). Cellular apoptosis was observed using Hoechst staining and transmission electron microscopy (TEM, H7650, HITACHI, Japan) to determine whether microwaves induce chromatin condensation and fragmentation, respectively, both of which are recognized morphological features of apoptosis. For Hoechst staining, PC12 cells were plated on glass cover slips. After differentiation and microwave radiation, cells were rinsed twice with cold PBS and then fixed in a mixture of methanol and acetone (1:1) for 15 min at 4°C. The cells were then washed in PBS for 3 min twice. Then cells were stained with 1 mg/L Hoechst 33342 (Sigma, USA) dye for 10min at room temperature in the dark. Finally, cells were mounted in a mixture of glycerine and PBS (1:1) and observed via LSCM. For electron microscopy, at least 1×106 cells were used. After centrifugation at 1000 rpm for 5 min, the medium was removed and the cell pellet was retained. In addition, rats were sacrificed after deep anesthesia by 2% pentobarbital sodium (60mg/kg). The right hippocampal CA3 region was collected and cut into pieces of approximately 1mm3. PC12 cell pellets or the hippocampal pieces were fixed with 2% glutaraldehyde for 24 h at 4°C and then postfixed in 1% osmium tetroxide for 2 h at room temperature. The samples were dehydrated, infiltrated and embedded in conventional epoxy resin. Ultrathin sections were cut and mounted on 200-mesh copper grids. The sections were stained with uranyl acetate and lead citrate, and then examined using TEM. The fluorescent probe JC-1 (Biyuntian Company, Beijing, China) was used to detect the mitochondrial membrane potential (MMP). JC-1 is a cationic dye that exhibits potential-dependent accumulation in mitochondria, indicated by a fluorescence emission shift from green (525 nm) to red (590 nm). At low membrane potentials, JC-1 exists as a monomer and produces a green fluorescence. At high membrane potentials or concentrations, JC-1 forms J aggregates and produces a red fluorescence. The decrease of MMP is recognized as another typical marker of early apoptosis. In accordance with the suppliers' recommendation, up to 1×105 cells/ml cells were cultured in 6-well plates for the assay. The cells were collected, centrifuged and re-suspended in 0.5 ml DMEM medium, before being stained with 0.5 ml JC-1 staining solutions for 30 min at 37°C in the dark. The cells were washed twice in staining buffer and re-suspended in 0.5 ml staining buffer. Flow cytometry was used to determine the fluorescence intensity of the red/green ratio semi-quantitatively. Terminal deoxynucleotidyl transferase (TDT)-mediated dUTP nick end labeling (TUNEL) assay was performed to confirm DNA fragmentation of apoptosis, using a commercial kit according to the manufacturer's instructions (Promega, US). Cells were plated on glass cover slips and fixed in 4% formaldehyde for 30 min. After two washes in PBS, 0.2% Triton X-100 for 5 min was used to permeabilize the cells, and then the cells were washed again in PBS, followed by incubation with equilibration buffer for 10 min. Biotinylated dUTP and TDT enzymes labeled the cells in a humidified box at 37°C for 1 h. After standard saline citrate incubation for 15 min, cells were treated with 0.3% H2O2 for 5 min and incubated in streptavidin horseradish peroxidase (HRP) for 30 min, followed by three washes in PBS before staining with 3,3'-diaminobenzidine (DAB) in the dark. Finally, cells were counterstained with hematoxylin, dehydrated in gradient ethanol, clarified in dimethylbenzene, and mounted in resin before observation under a microscope. Cells lacking the TDT enzyme were used as negative controls. Cells with brown nuclei were considered positive. An image-analysis system (CMIAS) designed by Beijing University of Aeronautics and Astronautics was used to calculate the percentage of positive cells. The mean of 10 randomly selected fields, at a magnification of ×400, was recorded for each group. In brief, cells were plated on glass cover slips and fixed in a mixture of methanol and acetone (1:1) for 15 min at 4°C. Incubation in 0.1% trypsin for 5 min permeabilized the cells. After blocked with 10% goat serum in PBS for 15 min, the cells were incubated with antibodies raised against NF, NSE, Bax and Bcl-2 (Santa Cruz Biotechnology, US) at 1:100 dilutions in PBS overnight at 4°C. As a negative control, PBS was used as the primary antibody. For immunofluorescence, cells were incubated with fluorescein isothiocyanate (FITC) labeled secondary antibodies (Santa Cruz Biotechnology, US) at 1:50 dilutions for 1 h. Following PBS washes, cells were stained with PI (1 mg/L, Sigma) in the dark for 10 min, and then mounted in a mixture of glycerol and PBS (1:1) and observed via LSCM. For immunocytochemistry, cells were incubated with biotinylated secondary antibodies and the streptavidin-peroxidase complex (Santa Cruz Biotechnology, US) at 1:200 dilutions for 1 h at 37°C. Each step was preceded followed by three washes in PBS. After DAB staining, cells were counterstained with hematoxylin, dehydrated in gradient ethanol, clarified in dimethylbenzene, mounted in resin and observed by microscopy. Cells with brown staining were considered positive. CMIAS assessed the mean optical density (MOD). The mean of 10 randomly selected fields, at a magnification of ×400, was recorded for each slide. All immunoblotting analyses, except detection of cytochrome c, were performed using whole cell lysates. Briefly, cells or left hippocampi were rinsed twice with ice-cold PBS and then lysed in sucrose buffer. After centrifugation at 750 rpm for 10 min to remove nuclei and unbroken cells, the supernatant was centrifuged at 15,000 rpm for 15 min to eliminate mitochondria. This supernatant was used as the cytosolic fraction for cytochrome c detection. For whole cell protein extraction, PC12 cells or left hippocampal tissues were suspended in radio-immunoprecipitation assay (RIPA) lysis buffer containing phosphatase and protease inhibitor cocktails (KangChen Bio-tech, China) for 10 min. Lysate supernatants were harvested by centrifugation at 12,000 rpm for 15 min. The bicinchoninic acid (BCA) assay (Bio-Rad) quantified the protein concentration. The proteins were separated by SDS-polyacrylamide gel electrophoresis (PAGE) and transferred onto polyvinylidene difluoride (PVDF) membranes by electroblotting. After blocking with 5% fat-free dried milk in TBS containing 0.5% Tween 20, the membranes were probed with antibodies raised against Bax, Bcl-2, cytochrome c (Santa Cruz Biotechnology, US), cleaved caspase-3 and PARP (Cell Signaling Technology, US) at 1:1000 dilutions in TBS overnight at 4°C respectively. Following TBS washes, the membranes were incubated with horseradish peroxidase-conjugated secondary antibodies (Santa Cruz Biotechnology, US) at 1:5,000 dilutions for 1 h. The membranes were washed again and developed with the super-enhanced chemiluminescence (ECL) plus detection kit (Applygen Technology, China), and then scanned with a multi-image II system (Alpha Innotech, US). The glyceraldehyde-3-phosphate dehydrogenase (GAPDH) antibody (KangChen Bio-tech, China) was used as an internal control. The caspase-3 inhibitor Z-DEVD-FMK (BioVision) was added into cell cultures 30 min before radiation according to the manufacturer's instruction. A caspase-3 activity kit (Beyotime Biotechnology, Nantong, China) determined the activity of caspase-3, according to the manufacturer's instruction. Briefly, cells or right hippocampi were lysed and centrifuged. The supernatant was retained and mixed with buffer containing the substrate peptides for caspase-3 attached to p-nitroanilide (pNA). After incubation at 37°C for 2 h, an enzyme-linked immunosorbent assay (ELISA) reader measured the samples at 405 nm. Caspase-3 activity was expressed as percentage compared to control. All experiments were repeated at least three times. Values were expressed as mean ± SEM. A t test and One-way ANOVA test were performed using SPSS17.0 software. A P value < 0.05 was considered statistically significant. Following NGF treatment, PC12 cells stop dividing and show a terminally differentiated neuronal phenotype, making them a useful model for neurobiological and neurochemical studies . Using inverted phase contrast microscopy, undifferentiated PC12 cells were observed as round (Fig. 1A). After NGF induction, neurites extended gradually from both ends of the cell body (Fig. 1B). The differentiation state of PC12 cells was determined by counting cells bearing neurites of lengths at least twice the maximum width of the cell body. The differentiated cells were both NSE (Fig. 1C) and NF-positive (Fig. 1D), suggesting they would prove useful as a model. It has been reported that the biological effects of microwave radiation is strongly related to the frequency, intensity and exposure time. The relationship between cell apoptosis and microwave intensity remains unclear. Therefore, we investigated apoptosis of differentiated PC12 cells induced by microwave exposure with different intensities. Annexin V-FITC/PI labeling results showed that the percentage of apoptosis and necrosis of differentiated PC12 cells increased significantly at 6 h after 30 (Fig. 2A), 50, 100 mW/cm2 microwave exposure, but no significant difference was seen in 10 mW/cm2 group (Fig. 2B). This demonstrated that cell apoptosis and necrosis was closely related to the intensity of microwave exposure. We selected the lowest effective dose of 30 mW/cm2 for further study of the mechanism of apoptosis. Moreover, the time course of radiation-induced apoptosis in differentiated PC12 cells for 30 mW/cm2 was determined. The results showed that 6 h was the peak time of apoptosis after exposure to radiation (Fig. 2C). The morphological changes of PC12 cells before (A) and after (B) differentiation induced by nerve growth factor (NGF). The differentiated PC12 cells were identified using antibodies raised against the specific neural markers, such as neural specific enolase (NSE) (C) and neural filament protein (NF) (D), by immunofluorescence respectively, and the results both showed positive signals (green) in the cytoplasm. Scale bars: A-B, 25 µm; C-D, 10 µm. AnnexinV-FITC/PI double staining was used to quantify apoptosis of differentiated PC12 cells after microwave exposure. The results showed that apoptosis and necrosis of PC12 cells increased obviously at 6 h after 30 mW/cm2 microwave exposure (A), and 30 mW/cm2 was the lowest effective dose for radiation-induced apoptosis in this study (B). Moreover, the time course of radiation-induced apoptosis showed that 6 h was the peak time of apoptosis after radiation exposure (C). Significant differences are as follows: vs. control, *p < 0.05, **p < 0.01 (ANOVA test). Scale bars: A, 10 µm. To further confirm that microwave radiation induced cell apoptosis, we detected several significant hallmark events of apoptosis, including chromatin condensation, apoptotic body formation, DNA fragmentation and depolarization of mitochondria membrane after 30 mW/cm2 microwave exposure. Hoechst staining showed chromatin condensation and apoptotic body formation of some differentiated PC12 cells at 6 h after microwave exposure (Fig. 3A). Moreover, chromatin condensation at the margins of nuclei, irregularity of the nuclear membrane and vacuoles in the cytoplasm were observed under TEM in both PC12 cells (Fig. 3B) and hippocampal neurons (Fig. 5A). Furthermore, the percentage of DNA fragmentation in differentiated PC12 cells increased significantly at 6 h after exposure (Fig. 3C-D). Additionally, mitochondrial depolarization was indicated by a significant decrease in the red/green fluorescence intensity ratio after microwave exposure (Fig. 3E-F). Taken together, the results show that 30 mW/cm2 microwave exposure did induce apoptosis of differentiated PC12 cells. Apoptotic stimuli can activate apoptosis-related proteins such as Bax and Bcl-2 to enter mitochondria, which induce the mitochondria to release cytochrome c, which in turn activates the caspase cascade and its substrates, such as PARP, finally triggering the execution of apoptosis. To determine the involvement of the mitochondria-dependent pathway in differentiated PC12 cells apoptosis induced by microwave exposure, we examined the expression of Bcl-2 and Bax, cytochrome c, cleaved PARP and caspase-3 activity. The caspase-3 inhibitor Z-DEVD-FMK was also used. The results showed that the expression of Bax, cytochrome c, cleaved caspase-3 and PARP all increased in both PC12 cells (Fig. 4A-C) and hippocampal neurons (Fig. 5B) at 6 h after microwave exposure, while the expression of Bcl-2 decreased obviously. Moreover, the activity of caspase-3 increased significantly (Fig. 4D, Fig. 5C). Furthermore, the caspase-3 inhibitor DEVD significantly inhibited the increase of cleaved PARP and caspase-3 activity induced by microwave exposure (Fig. 4C-D). These results suggested that microwave radiation increases the Bax/Bcl-2 ratio, leading to the release of cytochrome c, caspase-3 activation and PARP cleavage, which triggers the execution of apoptosis. Thus, the results indicated that microwave radiation induces cell apoptosis via the mitochondria-dependent caspase-3 signaling pathway. The biological effects of MW-EMF radiation includes both thermal and non-thermal effects, depending on a number of electromagnetic field parameters, such as the power, frequency, duration or intermittency of exposure, pulse shape and ambient field strength. Currently, little is known about the molecular mechanisms involved in the putative non-thermal effects. Moreover, it is likely that deleterious effects of microwave radiation on cells of the brain would be caused by non-thermal effects induced by lower intensities of exposure . In this regard, based on the investigation of the relationship between microwave intensity and the apoptosis, we selected the lowest effective dose for further study. Apoptosis of Chinese hamster V-79 cells was induced only when the temperature of the medium reached 40°C , and apoptosis of human Jurkat-T cells was not induced at 37.5°C for 48h . In the present study, the temperature of the culture medium or rat body during all the microwave exposure only increased by maximum of 0.5°C, which implied that the apoptosis of neural cells induced by microwave exposure was mainly caused by non-thermal effects. Previous reports showed that apoptosis was not induced by MW in human peripheral blood mononuclear cells  or lymphoblastoid cell , whereas in Jurkat cells and proliferating human peripheral blood lymphocytes, the caspase-3 activity increased significantly 6 h after exposure to 900MHz 1.35 W/kg radiation for 1 h . Moreover, several reports demonstrated that MW-EMF radiation is capable of inducing DNA damage in human cells [37, 38]. Furthermore, a recent study reported DNA damage and gene expression changes in brain cell cultures of mice after exposure to 10.715 GHz 0.725 W/kg radiation for 6 h in 3 days at 25°C . In addition, an increase in c-fos protein expression was induced in the paraventricular nucleus of the rat hypothalamus 90 min or 24 h after exposure to 2.45 GHz 0.9 W/kg radiation for 30 min . These results showed the possibility of apoptotic effects induced by microwave radiation. Hoechst staining (A) and TEM observation (B) examination of chromatin condensation and apoptotic body formation, respectively, of differentiated PC12 cells for 6 h after 30 mW/cm2 microwave exposure. Moreover, TUNEL staining detected DNA fragmentation (C), which was quantified by image-analysis software (D). Cells were loaded with JC-1 and then analyzed by flow cytometry (E). A decrease in the red/green fluorescence intensity ratio indicated mitochondrial depolarization (F). Significant differences are as follows: vs. control, **p < 0.01 (t test). Scale bars: A, 10 µm; B, 1 µm; C, 50 µm. 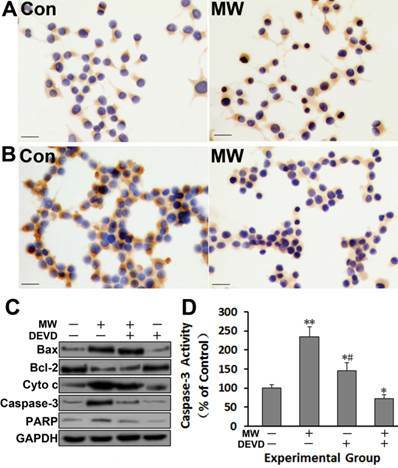 The expression of Bax (A) increased, whereas Bcl-2 (B) decreased, as shown by immunocytochemistry in differentiated PC12 cells 6 h after 30 mW/cm2 microwave exposure. All immunoblotting analyses (C), except detection of cytochrome c, were performed using whole cell lysates. After sucrose gradient centrifugation, the supernatant was used as the cytosolic fraction for cytochrome c detection. The immunoblotting results further confirmed the up-regulation of Bax, cytochrome c, cleaved caspase-3 and PARP, and the down-regulation of Bcl-2. Caspase-3 activity (D) also increased, as assessed by ELISA. Moreover, the caspase-3 inhibitor DEVD significantly inhibited the increase of cleaved caspase-3, PARP (C) and caspase-3 activity (D) induced by microwave exposure. Significant differences are as follows: vs. control, **p < 0.01 (t test). Scale bars: 50 µm. Neuronal apoptosis of rat hippocampus observed by TEM (A) 6 h after 30 mW/cm2 microwave exposure. All immunoblotting analyses (B), except detection of cytochrome c, were performed using whole hippocampal lysates. After sucrose gradient centrifugation, the supernatant was used as the cytosolic fraction for cytochrome c detection. The immunoblotting results further confirmed the upregulation of Bax, cytochrome c, cleaved caspase-3 and PARP, and the down-regulation of Bcl-2. Caspase-3 activity (C) also increased, as assessed by ELISA. Significant differences are as follows: vs. control, **p < 0.01 (t test). Scale bars: 500 nm. For neuronal cells, Zhao reported that short-term exposure to cell phone radiofrequency emissions (1900MHz) for 2h can up-regulate elements of apoptotic pathways in cells derived from the brain, and that neurons appear to be more sensitive to this effect than astrocytes, which suggested that specific CNS cells may activate different genes in response to cell phone emissions, and that there is a variable threshold sensitivity depending on cell type . Moreover, exposure of rat primary neuronal cultures to 900MHz 2W/kg MW-EMF for 24 h, may induce neuronal apoptosis through the caspase independent mitochondrial pathway activation . Apoptosis and decrease of Bcl-2 mRNA in SH-SY5Y neuroblastoma cells was also demonstrated after 900MHz GSM modulated MW-EMF for 24 h, with a SAR of 1 W/kg . Additionally, it has been reported that 2.45 GHz pulsed MW field at an average power density of 1 mW/cm2 for 3h/d (up to 30 days) could cause neuronal apoptosis in the rat hippocampus . By contrast, no significant increase in the apoptosis rate was found in the same cell cultures exposed to 900MHz GSM modulated MW-EMF for 24 h, with a SAR of 0.25 W/kg . This study demonstrated the apoptosis of differentiated PC12 cells 6 h after acute exposure to 2.856GHz microwave radiation for 5 min with average power density of 10, 30, 50 and 100 mW/cm2 respectively, which is close to the peak intensity caused by mobile phone handsets . Moreover, the frequency used in this study was similar to microwave relays, radar, satellite links and some mobile phones . Although the intensities used in this study were somewhat higher than the International Commission on Non-Ionizing Radiation Protection (ICNIRP) recommended limit for public exposure (10,000µW/cm2 for frequencies from 2 to 300 GHz) , this study provides a successful model for further investigation on the neurological mechanisms of microwave radiation. There are three different death signaling pathways leading to apoptosis: the extrinsic death receptor-dependent pathway, the intrinsic mitochondria-dependent pathway and the intrinsic ER stress-mediated pathway . For the intrinsic mitochondria-dependent pathway, the release of cytochrome c from mitochondria into the cytosol is fundamental to apoptosome formation and downstream caspase-3 activation . Caspase-3 is generally considered an important effector protease that is cleaved and activated during apoptosis , which in turn cleaves a variety of cellular substrates, most notably PARP. One of the most important functions of PARP is to help repair single-strand DNA nicks. Thus, cleaved PARP is a useful marker of apoptosis . Moreover, the members of Bcl-2 family are key mediators of cytochrome c release in the context of apoptotic stimuli . Among the Bcl-2 family, Bax is a pro-apoptotic protein, whereas Bcl-2 is an anti-apoptotic protein. Bax or Bcl-2 may control the mitochondrial permeability transition and facilitate the passage of cytochrome c . Thus, the Bax/Bcl-2 ratio determines the fate of many cells . Accordingly, an imbalance of Bax and Bcl-2 proteins may lead to the loss of the MMP and the release of cytochrome c, which triggers caspase-3 activation and results in apoptosis . Mitochondria are the primary energy producers of cells, and mitochondrial dysfunction of neural cells has been reported after microwave exposure [22, 23]. However, it is uncertain whether the neural cell apoptosis induced by microwave radiation is mediated by mitochondria-dependent signaling pathway. 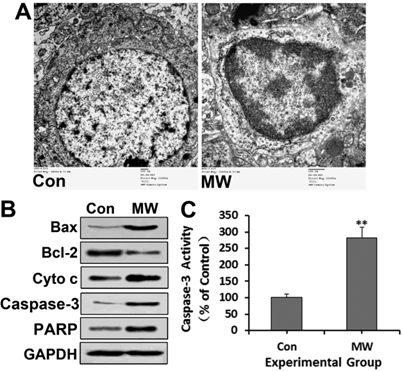 In this study, we focused on the mitochondrial-mediated caspase-3 apoptotic pathway and investigated the loss of MMP, the expression of Bax and Bcl-2, the release of cytochrome c and caspase-3 activity in PC12 cells after microwave exposure. Our results suggested that microwave exposure resulted in an increase in Bax and a decrease in Bcl-2, followed by loss of MMP, the release of cytochrome c and activation of caspase-3, representing the classical mitochondrial-dependent caspase-3 apoptotic pathway. In summary, this study demonstrated that microwave radiation could induce apoptosis of neural cell via the classical mitochondrial-dependent caspase-3 signaling pathway. Microwave radiation causes the loss of MMP by down-regulation of Bcl-2 and up-regulation of Bax, triggering cytochrome c release from mitochondria to the cytosol. Subsequent caspase-3 activation ultimately results in the execution of apoptosis. This study may provide the experimental basis for further investigation of the neurological mechanism of action of microwave radiation. Further studies are necessary to determine the precise mechanism of neural cell apoptosis induced by microwave exposure. This work was supported by the National Natural Science Foundation of China (30770527; 81102101), the Military Medical Fund (CWS11J073) and the Major National Science and Technology Program of China (2008ZXJ09004-019). We sincerely thank Dr. Su Zhentao, Wang Kai and Zhang Sa for their excellent technical assistance and guidance in microwave exposure, LSCM and TEM observation respectively. Corresponding author: Ruiyun Peng or Dewen Wang, Department of Experimental Pathology, Beijing Institute of Radiation Medicine. 27, Taiping Road, Haidian District, Beijing, 100850, China. Telephone: 86-10-6693-1236; 86-10-6693-1336; Fax: 86-10-6821-4653 Email: ruiyunpeng18com; wangdewen1938com.